← Thank you for your feedback! The Moss Street Paint Inis one of our favourite days around here. As thousands of people wander by, admiring the art festival that runs the full length of Moss Street, many people also wander in to Hemma to say hello. We LOVE this! To coincide with this community fun, we have an OPEN HOUSE on that day. On July 16th, we invite you stop by Hemma for prizes, sales, high fives and hugs! – Our awesome staff to greet you! Please leave yourself extra time to get to Hemma that day as Moss street is closed and parking spaces are limited. Extra high fives if you walk, bike, or take the bus! 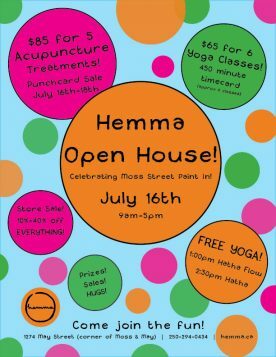 We look forward to welcoming you into our Hemmahome! !